Pictured right to left is Lions Club President David Ball, Blakeley Huskey, Parker Raney and Guthrie High School counselor Annie Chadd. 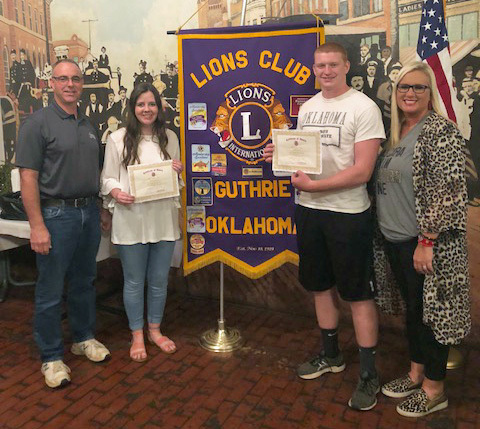 The Guthrie Lions Club recognized Blakeley Huskey and Parker Raney as their September Students of the Month. Huskey, daughter of Ben and Jessica Huskey, participates in student council, choir, Link Crew, Rainbows, National Honor Society and Victorian Singers. She currently serves as the student body president, plays the lead in fall musical, a State Officer in the International Order of the Rainbow for Girls and has won the Albert Pike Masonic Academic Excellence Award for three years. Huskey plans to attend the University of Oklahoma and major in political science. Raney, the son of Chris and Denise Raney, is involved with National Honor Society, football, wrestling and Southpointe Baptist Church. He is an Albert Pike Award winner, a Boys State delegate and was a Junior Marshal. Raney plans to attend Oklahoma State University and major in Electrical Engineering.